I am happy that Lori from Finding Radiance agreed to be interviewed. Her blog is one of the original ones I followed from the beginning. I definitely felt like I could relate to her story because she was a “big loser” like me. 1) How much were you at your heaviest and what motivated you to want to lose it? How long did it take to lose? The most I weighed was 250 pounds on the dot. I was a little heavy growing up and then into adulthood, I would lose some weight and then gain it back and more each time. When I hit 250, it seemed like such an enormous number. I thought to myself “That is halfway to 500 pounds” and I could see myself keep going. It was scary. While I didn’t really do anything right then and there, I set steps in motion, one of which was reading “The Sugar Addicts Recovery Program”. It spoke to me a lot. I took me 4 years to lose 100 pounds. 2) What method worked best for you to lose and maintain the weight loss? I had varying success with a lot of programs. The great thing about needing to lose 100 pounds is that you have the opportunity of trial and error since you have a lot to lose LOL! I started with just switching to whole grain foods like whole wheat bread and cereals (but still ate other processed foods). I also did Weight Watchers for a while, and I did 6 months of Nutrisystem to help me get refocused after a long plateau. But basically it all comes down to counting something, which is primarily calories or portion sizes. 3) What was the most challenging aspect of weight loss? I had a hugely long plateau after losing 75 pounds. Months long. It was tough to keep going when I was doing everything right and nothing worked. Plus I had a ton of life stressors at the time. So I started to gain some weight back and thought “Here we go again.” I ended up doing Nutrisystem after that for 6 months just so I could stop thinking about food for a while, and surprisingly, it ended up being a good tool for me. 4) Did you get any negative reactions/comments from people who weren’t supportive of your weight loss? How did you deal with that? I have never had any negative experiences or people holding me back from losing weight. It was mostly myself. I was teased incessantly growing up by peers, which still stings – even in my 40s. My family has always been very supportive. 5) Describe a typical day of meals/calories before and after the weight loss? We used to eat out a lot. Sometimes 3 meals a day when I was at my heaviest (and my husband was 40 pounds overweight as well). For breakfast, we might have bagels and I would get a cinnamon sugar bagel with sweetened cream cheese – with sweetened coffee. If we didn’t eat lunch out, it was something like a Lean Cuisine or some frozen entree I kept in the freezer at our business. We *always* had Starbucks in the afternoon. I would have a caramel Machiatto and some sort of bakery item with it. Dinner out would be something like Chili’s or something like that. And not anything off the light menu. If we ate at home, it was something like pasta or a frozen entree type of thing that was easy to fix. We had a lot of freezer-to-table meals, if you know what I mean. Oftentimes, we went out for coffee again at night. After losing weight, a typical day is oatmeal or protein waffles and fruit. If I have a bagel, I get light cream cheese and I don’t sweeten my coffee any more. Lunch is usually some sort of protein with fruit and a veggies. Dinner is the same. Protein, fruit and veggies on my plate. I still go out for coffee now – but I will get an unsweetened latte and maybe a treat, but not always – or I split it with John. I eat a lot less sugar now than I used to, which makes all that other food taste so much better. I still have things like cupcakes or chocolate, but I try to balance those out. Not saying I don’t have those days where I just eat a lot of junk, but those days are much more seldom now. 6) If you could do it all over again, what do you wish you had done from the start of your weight loss journey? I wish I had told myself years ago that you didn’t have to eat cardboard to lose weight. Good nutritious food can taste yummy! Also to be patient. I would go on and off diets and just hate eating ‘diet foods.’ I would never give myself a chance to really learn how to eat properly or understand portion sizes. Stuff that is old hat to me now was really hard to learn. It wasn’t so much how much I was eating, but what I was eating. 7) After losing a significant amount of weight, do you have loose skin anywhere? And if so, how are you dealing with it? Have you considered surgery? Yes. I have loose skin. Since I never had children, my stomach is okay – not tight, but it’s all right. Most of my loose skin is the rest of my lower body. I would need to have a lower body lift to take care of it and I don’t know as I am interested in that for monetary reasons and also because I don’t know if it would feel like me when I was finished – if that makes any sense. I could also lose 10 more pounds and it would probably help that out. 8 ) What kind of bike do you have? Do you wear special cycling clothes? I have a Fuji Absolute Hybrid bike which I bought in 2010 after my old Schwinn was stolen. I really like it. The tires are a little thinner than I would like – more like road tires, but the bike handles really well. I wear padded shorts and various wicking tops. I actually don’t like the cycling jerseys too much as they make me really hot. Isn’t that funny? I like the look of those, though. I feel badass riding in my Rosie jersey! I also have clipless shoes and dual pedals so I can either wear cleats or not. Best decision every for that. 9) You routinely bike a LOT of miles…what are some tips you have for someone just starting out to cycle? Take it slow and be consistent. The only way to get rid of saddle soreness is to ride, but build the miles slowly. Too many people go out and ride hard at first and are too sore after that to want to get back on the bike. If you ride every other day and go a little farther each time, you will be less and less sore and be able to ride farther. I almost never get sore anymore until I get over 80 miles LOL. 10) How has your personality changed since losing weight? I speak my mind a little more, but basically I am pretty much the same person. I dress differently now, though. 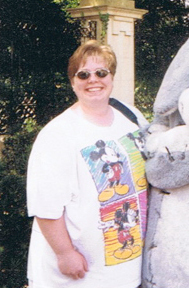 A lot of times I still feel like the fat girl, even after being at a much lower weight for several years. QUESTION: Are you reading Lori’s blog? What brings you back to her blog every day? Awesome story! I think a lot of people don’t realize how much sugar is in those sweetened coffee drinks. It really is a wonder how much better food tastes when you lower your sugar intake. Oh my god I used to drink a white chocolate mocha with caramel, whipped cream and chocolate!!! I read because I am amazed at what she does on that bike! I agree Karen! So inspiring. This is awesome! I love Lori and her blog. 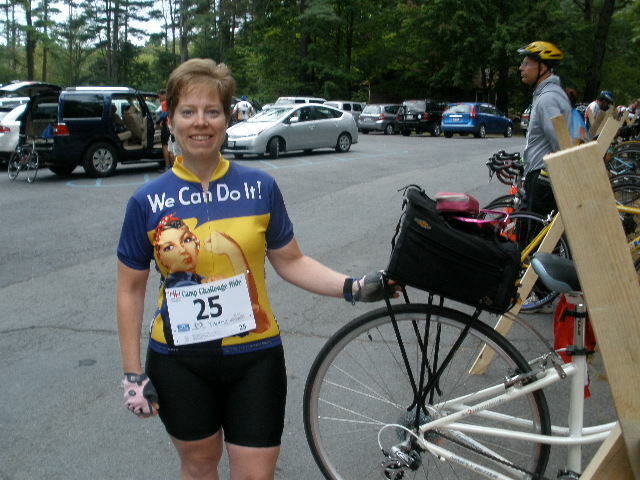 She inspired me to get on a bike and try for the longer distances not just quick trips. Love it! I love Lori’s blog too. Glad you liked her interview. Great interview! Thanks for featuring Lori—she’s very inspiring!! It’s taking me longer than I’d like to reach my goal of losing 100 lbs. I’m plateauing now (well, I may have just broken through!) but I know if I just keep at it and get back to basics, I can push forward. It’s nice to hear others have faced the same challenges! 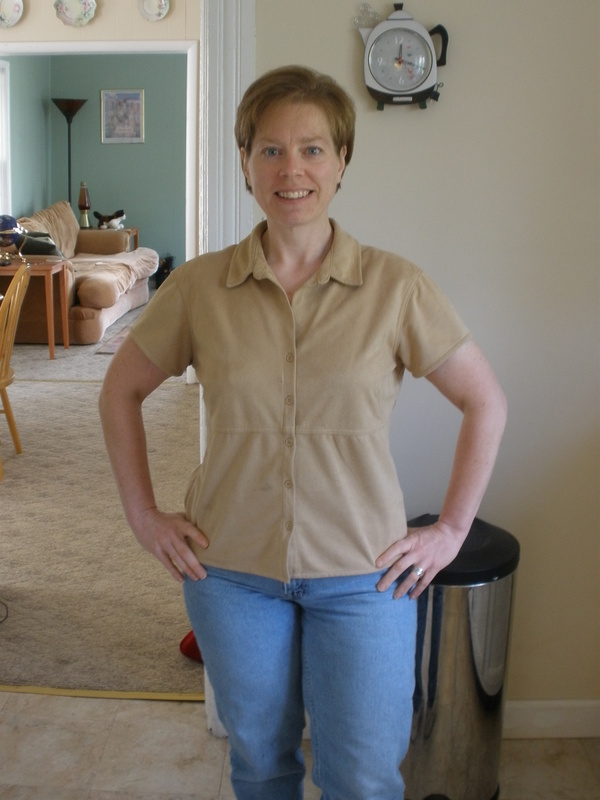 I had a REALLY long plateau after losing about 80 pounds or so. It took forever to lose the last 20 or so. Try weight lifting. I wish I had done that. I love Lori’s blog too. That’s so great that you were inspired to get a bike!